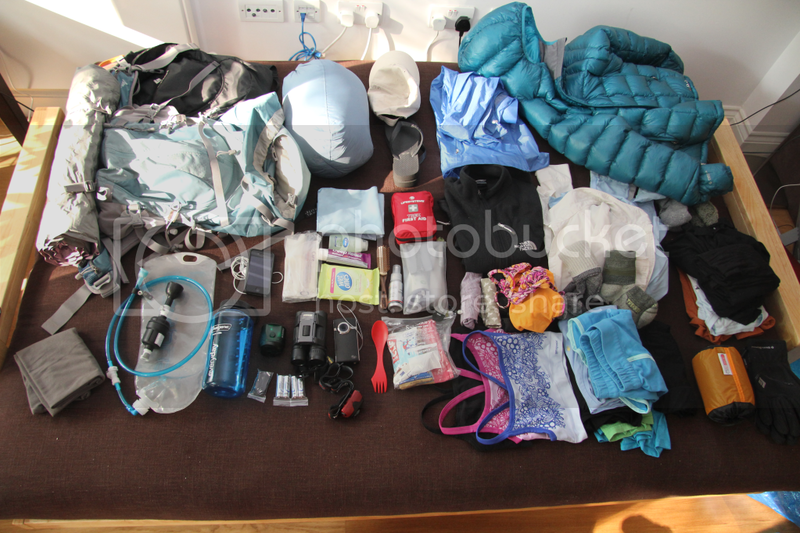 Right, so what do you pack for a week in the jungle and then a trek in the Andean Mountains up to 4,200 meters above sea level? The answer is … a lot. 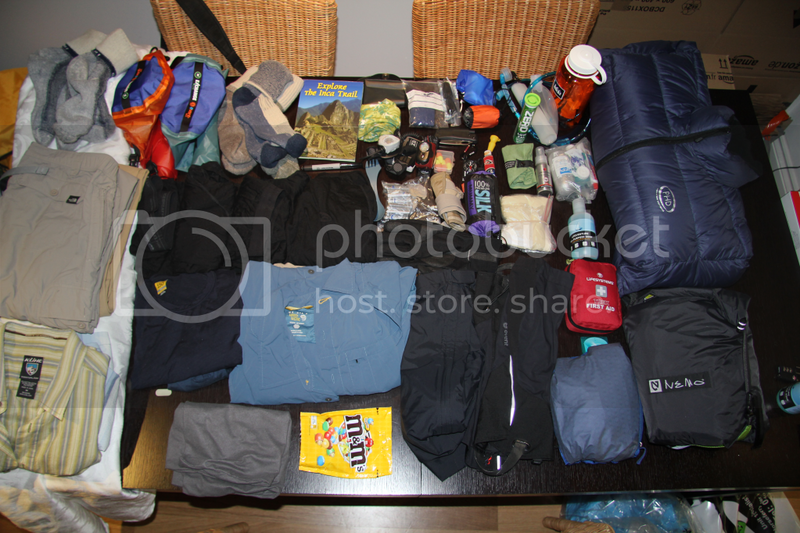 You don’t carry everything (as we will leave some things in storage at various points in our trip), but check out our pictures below with all our gear. PG16 – “Cheap Flights” – The hidden costs in 50p flights. PG16 – “Cheap Flights” – A very entertaining video about the hidden costs in lowest cost airfares with flights for 50 pence. We should be frugal in our travel planning and budgeting but those who have tried a lowest cost airline will be able to find some of their experiences reflected in the lyrics. This week I acquired a map of the world in a local travel shop. It’s great for a bit of inspiration and motivation plus it’s a scratch off map which is just plain neat. You scratch off the countries you’ve been too and it becomes more colourful as you go along. I’ve since found the same map online cheaper than it was in the travel shop, but it was an impulse buy and one I am happy with. Nonetheless for those interested you can purchase it on Amazon. As often as possible, go someplace you’ve never been before. After tons and tons of research we finally narrowed the available options of rainforest operators down and booked with Inka Natura. So far the interaction with them has been perfect. All positive reviews about them inspired confidence and we couldn’t be more excited about meeting them on the ground in some weeks to start our jungle adventure. Given that we will spend a week in the rainforest (Peru/Bolivia) and a week on the trail in Peru we were advised by our local medical centre to get a good helping of jabs and of course Malaria tablets. In general getting so many jabs is ok, but when you get two or three in one sitting you definitely feel it the next morning, sometimes with fever like symptoms. Rabies was also suggested but we opted not to get those as we won’t handle wildlife but merely hope to observe. However we may get some more advice from the jungle lodge once we make that booking. In general if you are caving or spelunking it’s highly recommended, bats are big carriers of the disease. The nurse actually said more people get rabies from petting or playing with stray animals than in than in the wild. When traveling somewhere new it’s always prudent to check with medical professionals about any precautions that you should or may want to take. Also remember that getting all these jabs and medication can become expensive so make sure you plan it as part of your trip budget. Luckily a lot of the vaccines and boosters usually last for several years, so once you’ve got them you won’t have to repeat the exercise too often. We’re thinking of it as an investment for future trips :-). Thanks to the great Anna at “Corporate Traveller” we now have our tickets to Peru booked for about £200 less in total than if we had booked directly with Iberia. Thanks to Anna’s help the booking was hassle-free for us too. Going from London, to Madrid, then to Lima and finally from Lima to Cusco, we’ll be travelling for over 20 hours, but it will be so worth it. Success! We managed to get permits for the Inca Trail through local tour operator Andean Life Peru. Now on to book our flights. When making arrangements to hike the Inca Trail it is best to book as early as possible. The trail is closed in February in order to do maintenance on the trail. This month is conveniently chosen as it is the middle of the rainy season so as not to disrupt any trekkers in their planning. At least two to three up to nine months in advance are usually good to plan for booking your permits. Access to the Inca Trail is well regulated these days with just 200 trekkers allowed on it any given day, plus local tour personnel that may accompany the trekkers. Our research was unclear as to whether one must go with a local guide (who’s authorised) or could trek alone with the permit in hand. In order to enjoy the trek a bit more going with a guide and cook (they would come with a porter for their equipment) may be preferable anyway. For a little extra money most operators offer this arrangement for a private group so you have support but are still on your own as far as random acquaintances are concerned in your own group. Some more reading in preparation for the 2012 trip to Nepal showed that it’s never too early to start preparing our bodies for higher atitude trekking. Suppose we could have chosen from many different all fascinating destinations that offer higher altitudes but we really wanted to try something totally different to anything we had experienced. So after not too much thinking actually decided to go to … *drumroll* … in Peru and do the Inca Trail to Machu Picchu. Now we will check dates and start the more detailed research. We will give Lima a miss. Any suggestions for things to do in and around Cusco? Looks like we picked the wrong destination. The protests that started a couple of days after we booked our tickets have now escalated in Cairo and other areas we wanted to visit. We hope for the best and most peaceful outcome of this for the Egyptian people and will visit another time. BMI won’t refund our tickets yet as they only do a 1-2 week refund window. Back to the drawing board. Were shall we go for our big trip in 2011?! ?